Power conversion refers to the altering of electric energy from one form to another. Digital power conversion is used to transform electric energy from analog current to digital current or digital current to analog current. Power converters such as voltage convertors are used for the conversion of electrical energy. These converters transform the frequency or voltage of the electric current as per the requirement. Consumers worldwide are inclining towards the digital power conversion systems. The market share of the digital power conversion product has been rapidly rising as compared to its counterpart i.e. analog system. 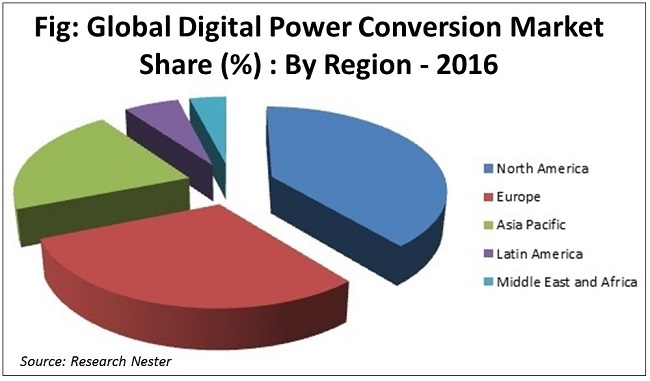 The market share of the digital power conversion market is increasing due to its growing use in the power system designs. Moreover, the advantages offered by digital power conversion over analog system are increasing the demand for digital power conversion system. The key advantages it offers over the analog system are the flexibility and control of power supplies. The market of digital power conversion system is anticipated to witness a robust growth over the forecast period i.e. 2017-2024. This can be attributed to various factors such as rising demand for digital power conversion system and government regulations on power supply systems. North America is the leader of the global digital power conversion market followed by Europe. North America accounted for the largest revenue share in 2016 and is anticipated to continue its dominance over the forecast period. The rising disposable income and government regulations and initiatives are believed to uplift the market of digital power conversion system in North America. Further, Europe is anticipated to witness a positive growth over the forecast period. This is expected to positively impact the growth of the global digital power conversion market. Increasing disposable income and quickly developing semiconductor industry are expected to drive the growth of digital power conversion market over the forecast period. Further, increasing use in the power system design is anticipated to be the dynamic growth factor of the global digital power conversion market. Further, technological progress focused at improving product performance and costs of the product are the major factor expected to drive the global power conversion market. Moreover, stringent government regulation on power supply is anticipated to garner the growth of global power conversion market. However, continuous usage of existing analog control loop is believed to dampen the growth of global digital power conversion market. In addition to that, environmental factors, safety concerns and operational expenses are anticipated to restraint the growth of global digital power conversion market.